Christopher Adey takes a final bow after 33 years with the Academy of St Thomas. The Academy of St Thomas concert on Saturday 3rd March in Norwich marked the end of an era when Christopher Adey conducted his 70th and final performance with the orchestra. In his 67 concerts and 2 recordings, the AST has worked with 61 different soloists playing 45 concertos – many more than once. Also 39 symphonies and countless other chamber orchestra works, including less performed repertoire have been introduced under his guidance. Chris was invited to conduct his first concert with the AST in September 1984 in Norwich Cathedral the year after the orchestra’s founder, the late Ivan Cane had retired from conducting. After training primarily as a violinist, with Manoug Parikian at the Royal Academy of Music, Chris was a member of Sir John Barbirolli’s Halle Orchestra before joining the London Philharmonic. Chris made his conducting debut with the BBC Scottish Symphony Orchestra in September 1973 (coincidentally the same month the AST gave their first concert! 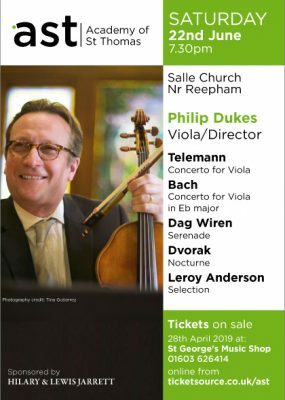 ), since when he has pursued a freelance career with orchestras throughout the UK and Europe as well as in the USA, Canada, South Africa, India and the Far East. It soon became obvious that Chris was exactly the right choice to encourage the orchestra to grow and develop into one of the country’s leading ensembles of its kind with its reputation drawing players from across East Anglia and further afield. He was appointed our principal guest conductor visiting Norwich twice a year for two weekends in March and October for the next 31 years observing many changes in the A11 along the way! There can be few entirely self-funded orchestras which exist for the sheer love of music, yet sustain such a strong relationship with an internationally-recognised conductor. The AST is very grateful for his dedication and commitment over such a long period. The programme for his final concert included the wonderful Beethoven Violin Concerto played by the fantastic young French violinist Amaury Coeytaux. Chris first worked with him in Singapore and introduced to the AST in 2016 when he played Brahms. The choice of Schubert’s Symphony No 9 ‘The Great’ included the AST strings, wind, brass sections and timpani who have been part of the AST in recent years playing one of their favourite pieces with him to bid farewell.